Includes 10% discount on drivers and crossovers! 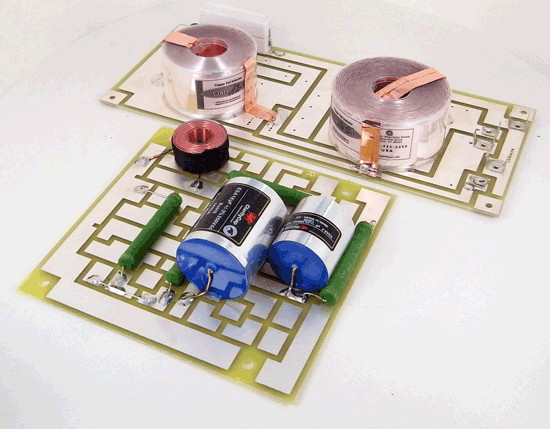 Two fully-assembled premium crossovers with Goertz Copper Foil inductors and Clarity CSA capacitors. Custom-designed 2-way using LEAP software. This system is both dynamic and affordable. 4 ohms Revelator woofer and HDS tweeter in a compact 22 liters bookshelf. Price is PER PAIR, that is two woofers, two tweeters, and two crossovers. Accessories are optional per pull-down menu. The system efficiency is around 87 dB with a nominal 4 ohms load. Revelator 18W/4531G-00 7" Revelator mid/woofer. Non-resonant cone and dust cap structure, dynamic linear suspension, SD-1 magnet system, “Grasshopper" cast chassis with maximized air flow and resonance terminating mounting system. Less resonance in all structures; lower compression and higher linearity; faster termination of excess energy; and higher sound pressure capability. This 7" slit paper cone driver is widely considered one of the best mid/bass units in existence. Made in Denmark. Discovery D2608/9130 1" Textile Dome HDS Tweeter. The Discovery tweeter uses a very light, low mass soft dome with high internal damping, and a highly-optimized, low-compression magnet system, which was designed especially for the low mass dome. The result is a driver with both good sensitivity and an impressive range into the lower frequencies. The low mass dome, coupled with a fully vented motor system, provides non-compressed sound reproduction over the entire frequency response. This combination allows the Discovery tweeter to be used in systems with lower cross-over points than recommended for most normal tweeters, making this product a powerful tool for any acoustic designer in the process of tuning a system. 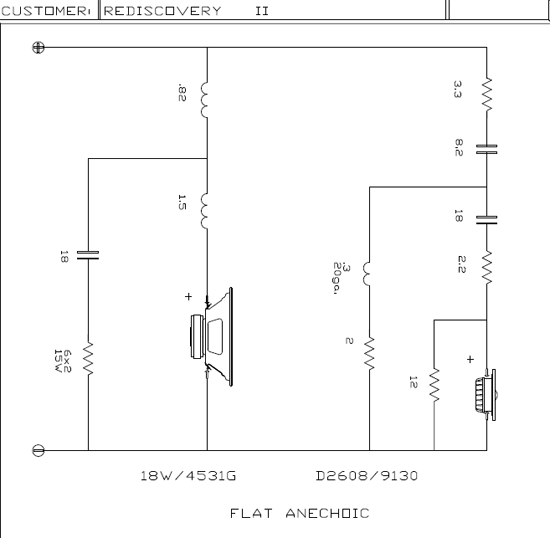 PLEASE NOTE: Assembled ReDiscovery II crossovers are quite large and are built on two boards per channel. The high-pass is on the MATRIX board measuring 5.6" x 5.625". The low-pass will be on a 103B, 9.55" x 4.05". This will require mounting one board on the cabinet base (floor) and the other on the side-wall. Please make sure you allow for this when building your enclosure. As always you can run the crossovers externally if you prefer. As noted above, crossovers will be built on two boards per channel using premium Goertz brand 16awg copper foil inductor on woofer and Clarity CSA cap in series on tweeter. Mundorf resistors in high-pass section. 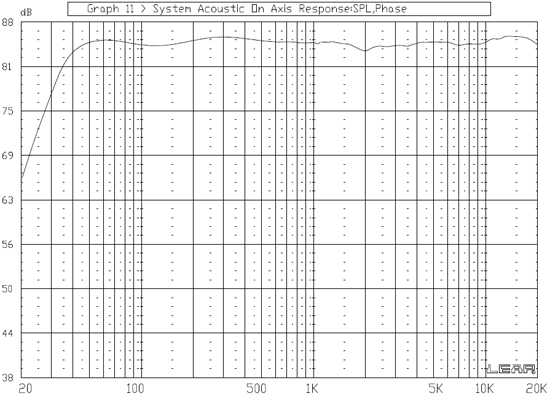 This graph shows the output in SPL across the frequency range. The left-most line is the woofer and the right designates tweeter. The crossover "point" is at about 2 kHz. 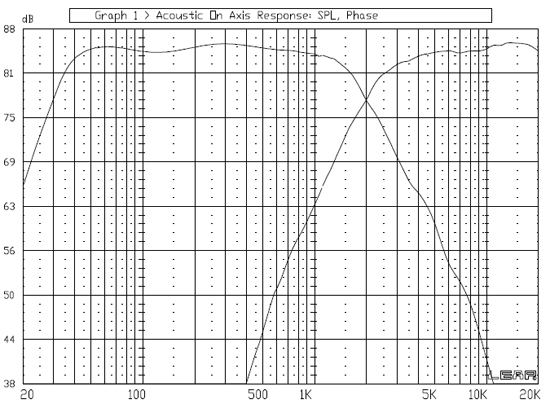 This graph shows the summed frequency response. Nominal output is in the mid- 80's dB region. Not super-efficient, but not too low either. 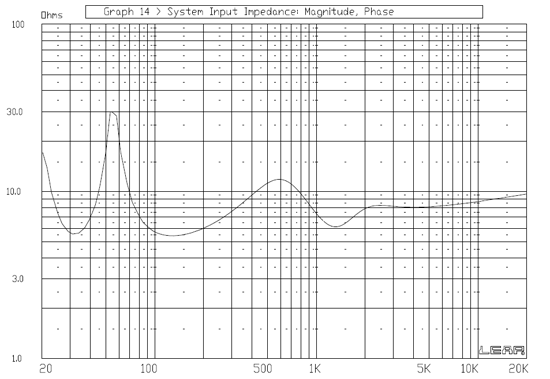 This graph shows the system impedance. Mostly 6 ohms across the midband. Should be a friendly impedance load to most amplifiers. The ReDiscovery II is based on a 0.8 cubic foot vented enclosure, external dimensions [18"H x 9"W x 12.75"D] and tuned with a single 2" diameter x 4" length vent (4.5"length if using internal flare). This accessories package is available for convenience as part of the kit, or feel free to purchase any of these items separately. As with all our kits, the discount only applies to this accessories package, not individual parts purchases. 20' of Supra Classic 1.6 speaker cable for internal wiring – 15awg Tin-plated Oxygen-free Copper from Sweden. One tube of Household Goop for adhering ports and insulation. Quick Connects x 16 for easier connection of drive units and terminal cups. Mounting Hardware: 22 of the 8x1 Socket Head Screws and 8 of the 6x3/4 Oval Head Screws for TD-CUPS. Damping Materials are one of our acoustic foam sheets (ours are 27" x 42" and 5/8" thick) and 1 lbs of Acousta-Stuf complex fiber fill. 2FLARE 2" Precision Flared Ports: two per kit, for vented box option- less the outer flare- which is too large to fit on the front baffle. You will receive the center tube, connector ring, and internal flare (we have found flared ports tend to provide better air flow than straight PVC). TD-CUP Terminal Cups: two per kit. High quality gold plated brass binding posts. Accepts banana plugs, spades or raw wire, and are bi-wire/bi-amp ready. Using the drivers and desired terminal cup or binding posts as templates, mark the enclosure for pilot holes. Cut internal wire to appropriate lengths. For this design you will want approximately 12" for the tweeter input, 12" for the woofer input; 20" for tweeter, 22" for woofer- per speaker. Adjust according to the cable type you are using. Solder wires to crossover, observing polarity. Install crossover inside cabinet. We recommend a double stick tape to adhere to the cabinet base. Solder input leads to terminal cup, observing polarity. Cut and install desired insulation materials. Typically you would cut a slit in the foam, then pull the drivers' lead wires out through their respective driver holes. Separate and fluff-out fill material such as Acousta-Stuf then place in cabinet, dispersing evenly throughout the main cavity. Apply gasketing tape material to cutout holes if desired. Solder wires to drivers, observing polarity. Align drivers with pilot holes and secure with wood screws or desired fasteners. Tighten slowly and evenly. Double-check polarity. If woofer polarity is incorrect, the loudspeaker will typically have weak or poor bass response. If tweeter polarity is wrong, the mid-basses may have a dip in response in the midrange and sound odd. Founded in 1970, Scan-Speak still resides at our original address in Videbaek, Denmark. Located in the heart of the Jutland peninsula, our acoustic engineers adhere to our legendary policy of "Never compromise". We never compromise on our product quality, sound quality or pursuit of perfection in a given application. We set the loudspeaker industry's gold standard for audiophiles, and are constantly viewed as a market benchmark by other high-end speaker manufacturers. For 45 years, Scan-Speak has been on a quest to create transducers that reveal the finest details in recordings, concealing nothing from the listener. This quest has resulted in several revolutionary inventions, where distortion in the magnet systems and the moving parts of the speaker is minimized. Our philosophy is simple: the emitted sound must be dynamic, giving a transient response and providing tonal balance. Scan-Speak transducers have righteously been called "the best that money can buy", and we agree fully. All our transducers are hand-built with the utmost attention to quality at their core. Their prices reflect this, providing solutions targeted towards high-end audiophile applications. Needless to say, Scan-Speak is dedicated to proving an unwavering high-quality in manufacturing. All Scan-Speak transducers can be customized to your exact preferences and requirements. Read more about our transducers on the Scan Speak site. 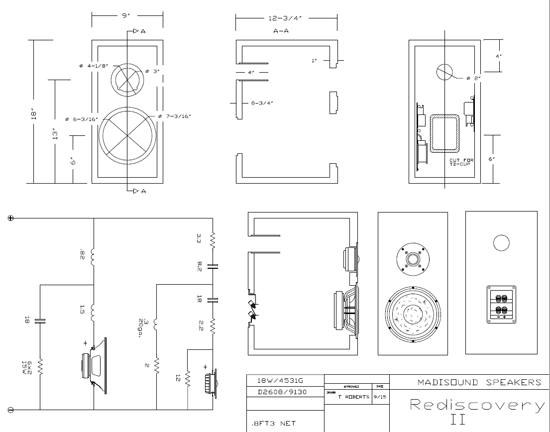 I have several speakers from madisound 2way kits version. This speaker produces more beautiful sounds than other more expensive ones. Of couse they depends on enclosures and also what kind of music I play. The kit was purchased to be assemblled into quailty monitors for a Yamaha keyboard. As such it performs admirably. The accessory kit provided the foam that was glued on most of the inside of the box, and the box was sealed so that all parts cpuld be removed from the woofer opening. As can be seen from the photographs (to be supplied), the drivers were mounted on the front surface of the boxes to get a good seal. Also, the crossovers were mounted to the foam in case their removal or repair were necessary. The boxes were made to inside dimensions exactly as per the supplied diagram of one inch MDF making them about 25 or so pounds each. The foam was glued on with a hotmelt glue gun which made the job go quicker as drying time is not too long. The tweeter crossover was mounted on the side wall since the heavier woofer crossover took up all the space on the box floor. The tweeter crossover was placed so that it's induction coil was as far away from the woofer crossover inductors to minimize crosstalk. Per the above the system performs well compared to others in its class.